Cycling is an excellent sport for all ages, however modern high performance bicycles are not designed to accommodate children’s body proportions and small size. To date no brand or supplier has been able to replicate the real race geometry into a children’s bike due to the fact that everything is designed for adult bikes. Almost every component on TheOne is custom made for small people. The Seat, the handle bars and especially the cranks and gearing are all designed for smaller people. We've used levers that are easy for small hands to change gears. All too often we see small sized bikes with adult sized cranks, bars, seats etc. The components on TheOne have been custom made to suit these machines and the people who will ride them, they are not assembled from components in the "parts bin". If you've bought a bike from one of our competitors and now realise that you can't get the seat low enough to accomodate the adult sized cranks that came fitted to your bike, I am sorry but we don't sell our short cranks except with these bikes - they were custom made and are a key selling feature of our bikes. The handlebars are specially made so that children’s smaller hands can safely and comfortably operate the brakes and shifters. Both sizes use the contemporary integrated brake levers and shifters on the handlebars. The Pro-Lite TheOne children’s road racing bicycle is used by cycling federations worldwide to develop the next generation of champions. 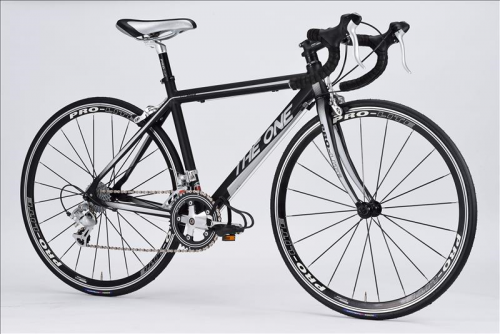 If you want the best junior race bike on the market, then accept no substitute, TheOne is ready to race, and win straight out of the box. If your club or cycling team is interested in purchasing 8 or more bikes please contact us for bulk-buy pricing. Pro-Lite P.B.S. 7005 triple butted tubing, TIG welded frame. New Shifter location on the handlebar! This product arrives 90% assembled, only the bars, wheels and seat post require fitment. We recommend that you have the bike checked by a bicycle mechanic prior to riding.